Visit the French town of Annecy and the Swiss city of Geneva on this full-day tour from Chamonix. 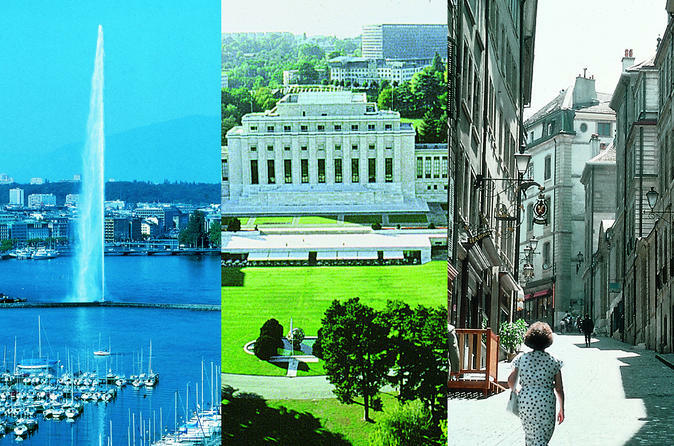 Marvel at Geneva landmarks such as the English Garden, the Flower Clock, and the UN headquarters; enjoy a walking tour of the atmospheric Old Town; and visit Annecy’s medieval castle. Make your own way to Chamonix Sud Bus station to meet your guide in time for a 7.30am departure. Traveling aboard an air-conditioned coach, soak up the scenery as you wind through the Alps and cross the border into Switzerland. After an around 1-hour journey, arrive in Geneva, a city on the banks of the magnificent Lake Geneva. Set out to explore the city on a sightseeing coach tour, admiring views of the Flower Clock (L’horloge Fleurie), the United Nations headquarters, and the beautiful English Garden (Jardin Anglais), as your guide offers live commentary. Then, jump out to explore the historic lanes of the Old Town on a guided walking tour, passing landmarks such as the Cathedral of St Pierre, the Barbier-Mueller Museum, Maison Tavel, and Place du Bourg-de-Four. Enjoy some free time to shop for souvenirs and tuck into lunch (own expense) at a local restaurant, before hopping back aboard the coach for the journey back to France. After crossing back over the border, stop in the alpine town of Annecy, renowned for its colorfully painted houses and medieval Old Town. Follow your guide on a walking tour, stopping to take in the views from the hilltop Palais d’Isle and visit the Château d’Annecy. After returning to Chamonix, your tour ends back at the bus station.